» fsmpublicauditor.fm » what's new? On August 31, 2008, Mr. Donald Yamada better known as “Don” returned to his home in San Francisco Bay area. Don joined the ONPA in August 2006 as an Audit Supervisor. After completing the 2-year contract, Don decided that it was finally time to go home. Before his departure, the staff prepared a farewell party at Nihco Marine Park in Sokehs Municipality . During the function, the staff especially those who had the opportunity working under his leadership expressed deep appreciations and further wished good luck on his home-bound trip as well as for his future endeavors. Moreover, the Pubic Auditor Mr. Haser Hainrick and the staff acknowledged his many contributions and assistances to the Office. In particular, Don's great leadership made the Review of the FSM Permanent Mission to the United Nations, Inspection of the FSM Embassy in Tokyo and the Review of the CFSM Funded-Public Projects in the States of Yap , Pohnpei and Kosrae a success for ONPA as a whole. Furthermore, staff who worked closely with Don, acknowledged the skills and knowledge he shared and handed down to them for the last two years. During the farewell function, one of the exciting activities was Don's unusual and inspiring moving sale. The sale was unusual because staff had to draw numbers to win the right to buy individual items ranging from portable furniture, appliances, utensil to personal computers, CD players and other electronics. The sale was inspiring because Don generously donated the proceeds as a gift to a family living close to the OPNA office in FSM National Government Complex in Palikir. 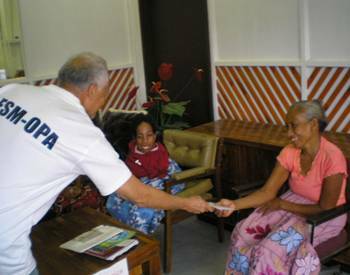 Photo by I. Alafanso: Don hands over his gift to the family, ONPA Main Office in Palikir. ONPA staff once again extend their appreciation to former Audit Supervisor Don for his efforts and contributions for the past two years and wish all the best for his future.